Panzini’s Patisserie, founded in 1959 by the two brothers Giovanni and Giuseppe Panzini, has always offered an exclusive and artisan production and after 50 years of activity the house remains faithful to tradition. Brothers’ Panzini are specialized in the processing of hazelnuts, a typical and excellent product of the north of Asti, and they produce everyday, by hand, home-made products with simple, natural and high quality ingredients as hazelnuts, sugar, eggs, acacia honey and natural vanilla. The flagship of Panzini’s is the famous Nocciolina, a cake without flour made with the best hazelnuts from Val Rilate, without additives or preservatives. The absence of flour allows the hazelnut to express its full and intense flavour and its inimitable fragrance. Thanks to the architecture of the old family wood oven, which allows a right balance among large and open spaces, the process of cocking is slow and uniform; a classical cocking process that only an ancient and traditional bakery can still guarantee. Panzini’s range also includes the Nocciolina dusted with cocoa and the new Nocciolina with almonds. Among the different size of the cake it is also possible to find the single 75g portion for a simple, tasty and healthy break. Code: T01 – 300g hazelnut cake in transparent cellophane, carton of 9 packets. Code: T09 – 80g mono portion hazelnut cake, carton of 21 packets. Code: T05 – 200g hazelnut cake in elegant lithographed box, carton of 12 packets. Code: T02 – 300g cocoa hazelnut cake in transparent cellophane, carton of 9 packets. Code: T10 – 80g mono portion cocoa hazelnut cake, carton of 21 packets. Code: T06 – 200g cocoa hazelnut cake in elegant lithographed box, carton of 12 packets. Code: T03 – 300g almond cake in transparent cellophane, carton of 9 packets. Code: T11 – 80g mono portion almond cake, carton of 21 packets. Code: T07 – 200g almond cake in elegant lithographed box, carton of 12 packets. Code: T04 – mixed carton of 9 cakes in transparent cellophane. 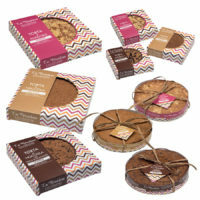 Code: T12 – mixed carton of 21 mono portion cakes. Code: T08 – mixed carton of 12 cakes in elegant lithographed box. The Lady’s Kisses are a typical product of Tortona, Langhe and Monferrato and they were legendarily born from the imagination and the brilliance of the cook of the Court of Savoy who found himself to meet the request of the King Vittorio Emanuele II who wanted to taste a new and particular dessert. Two tasty butter cookies that come together, just like in a warm kiss tasting of dark chocolate: that’s what Lady’s kisses are! Brothers’s Panzini reproduce the royal recipe in a new variant: the Lady’s kisses without flour. The maize biscuits are a typical Piemontese cookie. Born out of necessity in a past when the wheat harvest was scarce and very expensive, the maize biscuits, made of corn and wheat flour mixed, are now a “slow food” product of high excellence. Today, brothers’ Panzini modify an old, homemade and farming recipe adding to the corn flour the finest hazelnut one: a classic biscuit with a new intense flavour. The“brut ma bun” is a traditional Piedmontese biscuit with its unmistakable irregular shape, that was invented in 1878. This dessert was the favourite of the poet Giousuè Carducci, the composer Giuseppe Verdi and Queen Elena of Savoy. 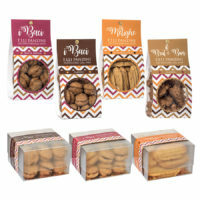 Brothers Panzini give their best with this crunchy and tasty biscuit that smells of hazelnuts.